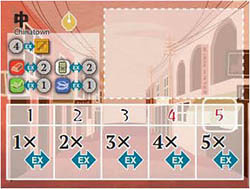 Gain 1 or 2 Order cards. 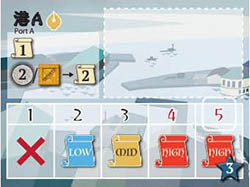 There are two Port Areas: Port A and Port B, which refer to different Port Order Form Boards. If this action is chosen, you may either choose to take 1 Order card for free or 2 Order cards if you pay 2 Yen or 1 Imported Good token. Note: You can hold up to 3 Order cards in your hand. You may not take cards if it would cause you to have 4 or more cards. Order cards can never be discarded. 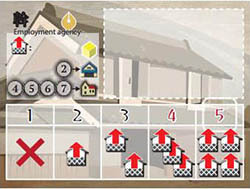 5 Power: You may take an Order card from the Low and/ or Mid and/or High area. In addition, you gain 3 Victory points. Example: Hisashi is carrying out the Port action. He pays 2 Yen which allows him to draw 2 Order cards. On the Port Area, he has his President pawn and 2 Assistant pawns for a total of 3 Power. 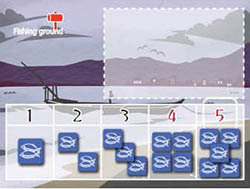 He takes 2 Order cards from the Low and Mid areas of the corresponding Port Order Form Board. 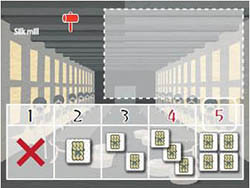 After drawing Order cards into your hand, move all cards to the left, filling in all empty spaces. 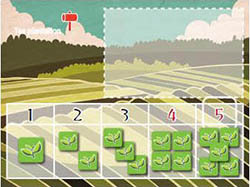 Then, fill all empty spaces on the Order Form Board with Order cards from the Order card deck until all spaces are full. If the deck is empty, fill as many spaces as possible and leave the remaining spaces empty. There are two Laboratory Areas: Laboratory A and Laboratory B, which refer to different Laboratory Tech- nology Card Placement Areas. To gain a Technology card, the Industry value has to be paid. The Industry value is written on the top left of the card. 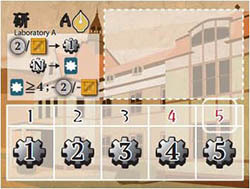 In addition, the rightmost spaces on the Laboratory Technology Card Placement Area may add addition- al Industry value to the card that has to be paid. 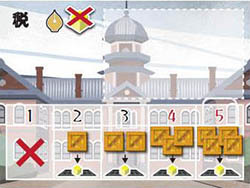 Example: THE Tram card is located 3 spaces from the left on the Technology Card Placement Area. The Industry value cost of this card is 5 plus 1 from the Management Board for a total of 6. The Industry value can be paid with Action Power, Money and Imported Goods. Note: The maximum value that can be gained from Ac- tion Power is 5 Industry value. After paying the Industry value, place the Technology card face-up in front of you. Excess Industry value is lost. Example: Hisashi needs 6 Industrial value in order to get the Tram technology. 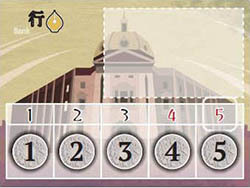 First, his President pawn, 3 Assistant pawns and 1 Shophouse gain him 5 Power, which translates into 5 Industry value. In addition, he pays 2 Yen for 1 more Industry value. In total, he pays 6 Industry value and obtains the Tram technol- ogy. Note: Players can hold any number of Technology cards. However, the 5th Technology card and later each cost either an extra 2 Yen or 1 Imported Good token. If you are unable to pay this additional cost, you may not obtain a Technology card. After obtaining a Technology card, move all cards to the left on the Technology Card Placement Area, filling in all empty spaces. Then, fill the rightmost empty space with a card from the Technology card deck. If the deck is empty, leave the space empty. Gain Assistant pawns, Shophouses and Trading Houses from your Warehouse tile. In addition, money has to be paid for certain token types. Exchange Money, Trade Goods and Imported Good to- kens. The number of times you may exchange depends on the Action Power. Note: There is no option to sell Imported Good tokens for Money. Faith values can be obtained by Action Power, Trade goods, Money, and Foreign Good tokens. Note: You may not pay more than 1 of the same kind of the above to gain more Faith value on the same turn. 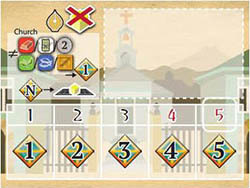 Then, place 1 Assistant pawn from the Church Area or your hand to the Church Management Board corresponding to the Faith value that was paid and gain the corresponding reward. You may not place an Assistant pawn if spaces are already filled. Assistant pawns placed on the Church Management Board may not be moved for the rest of the game. Excess Faith val ue is lost. Example: Hisashi carries out the Church Action. He has 1 Pres- ident pawn and 2 Assistant pawns for 3 Power. This translates to 3 Faith value. In addition, he pays 1 Copper token, 1 Raw Silk token and 1 Yen to increase this Faith value by 3 to a total of 6. He places one of his Assistant pawns on the Church Management Board on the space with a Faith value of 6. 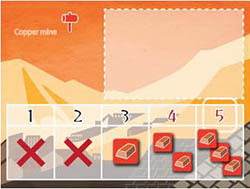 He then obtains the reward of 5 Victory points and the ability to move 2 pawns (which must be carried out immediately). Paying Imported Goods to obtain rewards. Then, place 1 Assistant pawn from the Customs Area or your hand to the Customs Management Board corresponding to the number of Imported Goods that was paid and gain the corresponding reward. You may not place an Assistant pawn if spaces are already filled. Assistant pawns placed on the Customs Management Board may not be moved for the rest of the game. Example: Hisashi carries out the Customs Action. His President pawn and 1 Assistant pawn give him 2 Power. He pays 1 Imported Good, and places 1 Assistant pawn on the 2nd space on the Customs Management Board. This gains him 4 Victory points and 2 Yen. No pawns or tokens may be placed in this area. 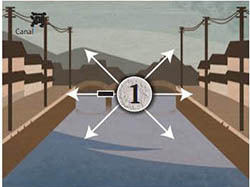 However, during the Movement step, you may pay 1 Yen to the supply to move across the Canal.